If you plan on doing a lot of cutting, then add more cutting sticks to your order, so your always get the best cuts. A worn out cutting stick can cause poor cuts. Each stick can be rotated and flipped for 8 clean surfaces until it needs to be replaced. The Formax Cut-True 16M Manual Paper Cutter is perfect for use in print shops and in-plant finishing. Excelling in transforming brochures, invitations, and more with crisp, accurate cuts, the Cut-True 16M boasts a number of standard features including a hardened steel blade that easily slices through paper stacked over 3 inches high. The guillotine blade and LED laser ensure precision cuts. The front and rear transport covers, blade lock, and wooden paper push all ensure user safety. The 16M also comes with a rugged, all-metal stand. Check out more of its great features below! Formax Cut-True 15M, 16M, and 22S cutters. The Formax Cut-True 15M and 16M are manually operated guillotine cutters. All Cut-True cutters include a rugged metal stand. 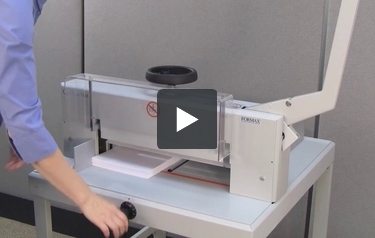 The 15M cuts paper stacks up to 2.15” high and can handle paper sizes up to 16.9” wide. The 16M easily cuts a stack up to 3.15” high and handles larger paper up to 18.7” wide. The back gauge easily adjusts forward and back for various paper sizes and cuts. A scale is located on the side rails with metric and standard measurements. The dial on the back gauge crank has additional markings for fine tuning. A spindle guided clamping system easily lowers the paper clamp in place for accurate cuts. The long lasting heat treated steel blade gives smooth clean cuts every time. Standard on all Cut-True cutters, the bright LED laser line provides visual accuracy. The transparent Plexiglas cover is part of the Cut-True safety system. It covers the blade during the cutting process. When in the open position, it locks the cutter lever in place preventing the blade from being lowered. As another safety feature, the back gauge crank can easily be disengaged when not in use. The Cut-True 22S semi automatic cutter. The Cut-True 22S effortlessly cuts through stacks of paper up to 1.75” high and up to 16.9” wide. It has all the features of the previous models with the addition of an electronic cutting system. The 22S has a power switch and key lock for security and safety. In addition, it utilizes two buttons to activate the cutter. Both buttons must be pushed at the same time to lower the cutting blade. Like the manually operated models, the Cut-True 22S has a metric and standard scale on the back of the gauge. It also features a digital LED display on the front panel ideal for fine tuning. Operator adjustment features: The blade cutting depth is easily fine tuned with the blade adjustment device. Changing blades and cutting sticks on the Cut-True is simple. On the 15M and 16M, a notch is located near the center of this stick for easy removal and replacement. The Cut-True 22S has a mechanical release for accessing the cutting stick. Blades can easily and safely be removed with the blade change tool. Remove the four outer screws. Then attach the blade change tool. Remove the center screw then safely remove and replace the blade. Formax Cut-True replacement blades and cutting sticks are a great value and up to 25% lower cost than competitors. Formax Cut-True cutters are feature rich and built to last.